This is the final post in a three part series by Colleen M. Feldman, who contracted polio in 1941, just prior to her 13th birthday. 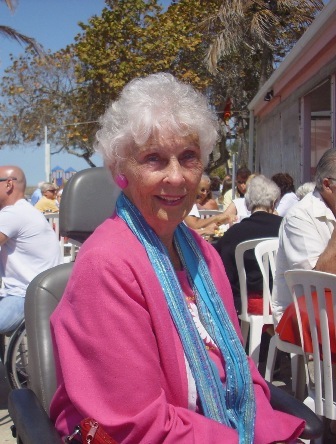 In this post, she reflects on her life with polio and retirement. Mrs. Feldman brings a unique perspective to Disability.Blog, having lived with a disability more than 50 years before the Americans with Disabilities Act (ADA) became law. She is also the mother of Disability.gov’s Web Content Manger, Bob Goldstraw. After I retired in 1993, I began going to Florida for the winters. Swimming was part of my therapy, so by the time I hit 65 and was living part of the year in Florida, I was in and out of the pool in colorful bathing suits and matching visors, not ashamed of my legs at all. During the 90s, I fell and broke my hip, and after much rehabilitation, recovered. I later fell and broke my knee. From that point on, I was advised to use a wheelchair. The doctors called me a “fall risk.” I do not feel that I miss out on much by using a wheelchair or scooter. I have a mobile home in Florida with a ramp that lets me come and go independently. And my accessible van still gets me to where I need to go to – I run errands, attend church and volunteer. When I think back over several decades, I realize that while much has changed for the better for people with disabilities, a lot has remain unchanged. I often find comments and questions by older people a great source of irritation to me. I am asked questions such as, “Who dresses you?” ”Can you stand?” “Who takes care of you?,” “How did you ever have babies?,”“How do you possibly manage since your husband died?” (In 2000, I met a wonderful man, fell in love and married him. He passed away in 2008.) Little do these people know that I had lived alone for 20 years before my second marriage, and I have always found creative, new ways to do what I need to do and live independently!